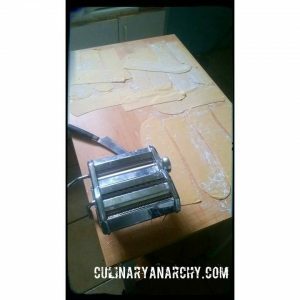 When I started working on this recipe, my biggest concern was that I didn’t have a pasta machine. This is a good thing because chances are, you don’t either. People have been making pasta for a long time and we seem to have forgotten how to make it by hand and the truth it, while it might be a bit time consuming, it’s a lot of fun and not really hard to do at all. One thing to keep in mind is that the dough does need to be rested for about an hour and you can use this time to smoke a joint and make the filling and sauce. Pour your flour onto the cutting board and form a well in the center. Crack 3 of the eggs (the other is for the egg wash) into the center of the well and mix with the fork. This is when it becomes a matter of feel. While you’re mixing you need to be slowly pushing the the flour toward the mix. It takes a minute and the dough will be a bit sticky. Add a little more flour to keep it from sticking to the board and knead it for at least 5 minutes. Wrap the dough in plastic and let it sit for an hour while you work on the filling and sauce. Make the egg wash. It’s just one egg and an equal amount of water mixed and it acts as a glue to hold the past together. Clean off your work space and lightly dust with a bit of flour as well as your rolling pin. Take a small chunk and start to roll it out. Since we’re doing ravioli, you want it to be in long, rectangular strips. It takes a bit of practice but you you will learn to feel the dough and work with it. The key is trying to get it as thin as possible without breaking it. Once you have a few strips laid out you can brush them with a thin coat of egg wash and and scoop out your filling on half and then fold the other half over. Lightly press around the filling to get the air pockets out and seal it but you don’t want to tear the dough. Coat the top with the egg wash and cut into individual ravioli. Seal them with a fork by pressing down on the edge and pulling away. It doesn’t take much so don’t overdo it. Cook in boiling water for 2-3 minutes until they float, strain and store on a sheet tray lined with cornmeal or wax paper to keep them from sticking. Keep in mind that since we are measuring by volume, the recipe is more a matter of feel than precision. If you don’t have a rolling pin, a wine bottle with the label removed works great. I’ve had to do this a few times. As far as the filling, that’s up to you. Meats, cheese, herbs, whatever. This dish was invented as a creative way to make use of leftovers. I used a bit of sausage and onions with mozzarella but really it’s up to you. One thing to remember is that whatever you use should be cut rather small so that it stays compact and doesn’t rip the dough. As far as sauces, that’s up to you, I used a simple red sauce but if you think something sounds good don’t be afraid to try it out and play.